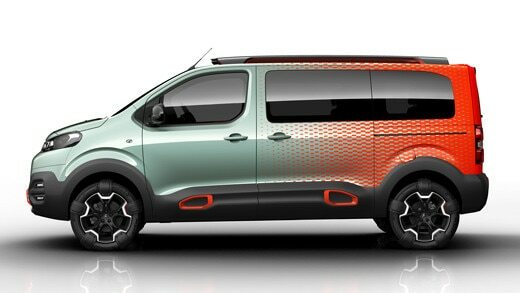 Coinciding with the launch of the new SpaceTourer, Citroën unveil a bright, vibrant 4x4 concept vehicle: the Citroën SpaceTourer HYPHEN. Discover this Citroën concept, bursting with optimism and energy that amplifies the character of the production version. To emphasise its all-terrain credentials, five rubber straps are fitted around each tyre to suggest optimum grip. This strap design also features on the concept’s front and rear bumpers. Formed from anodised aluminum, they give the impression of even greater sturdiness. It brings to life the experience of travelling as a family or group of friends, when fun and freedom awaits you. Hyphen Hyphen, remind you of something? 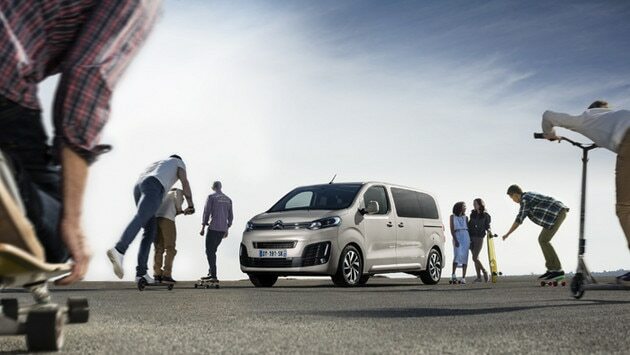 Citroën joins forces with pop group HYPHEN HYPHEN, who are a lively young group from Nice, in the South of France. Nominated for 2016 French music awards, HYPHEN HYPHEN are becoming hugely popular in the electronic pop scene. Now you understand where the supercharged design come from! 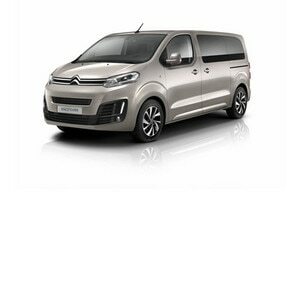 Citroën SpaceTourer HYPHEN has an SUV personality and accentuates the original, robust style of the production vehicle Citroën SpaceTourer. 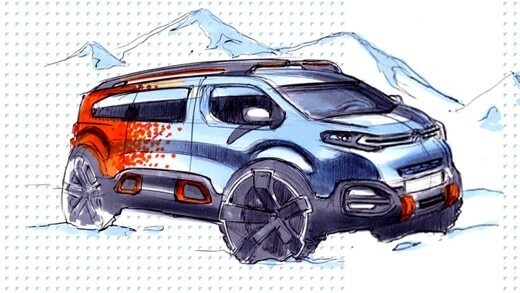 The concept has a broader front bumper design, wheel arch trims and sill protectors inspired by the Aircross concept. All of these features are finished in a matt dark moondust colour that is magnified by red-orange highlights. It provides even greater freedom, thanks to a 4x4 drivetrain. SpaceTourer Hyphen also immerses passengers in a casual, colourful atmosphere in which everyone enjoys VIP treatment. It is always ready for action, in the spirit of true off-road vehicles, and confirms its ability to get to the hardest-to-reach places. When you open the sliding side door, passengers are instantly ushered into a dazzling environment with a bright, dynamic atmosphere that promotes well-being. Each seat is given a unique colour scheme, repeating the shaded tones and graphic choices throughout the cabin. The lower portions of the seats are finished in sea-green nappa leather with contrasting top stitching. With a higher ride-height than the production version, SpaceTourer HYPHEN sits on 19-inch diamond-cut matt black alloy wheels with red-orange detailing. The roof lining and dashboard are wrapped in a special fabric to harmonise with the colours and design of the seats. Asymmetric style and bold 2D and 3D aesthetics guarantee an energising experience where all the occupants can enjoy fun, freedom and unlimited adventures. Equipped with a BlueHDi 150 S&S diesel engine and a six-speed manual gearbox, SpaceTourer HYPHEN concept has on-demand four-wheel drive developed in collaboration with Automobiles Dangel. This drivetrain has the trailblazing capabilities of a 4x4 and also preserves the handling and dynamic characteristics of the production SpaceTourer. This all-terrain option delivers improved traction in challenging conditions when there is reduced grip. The SpaceTourer HYPHEN concept also has higher ground clearance than the production vehicle. This bespoke 4x4 transmission doesn’t compromise any of the standard SpaceTourer’s characteristics in terms of comfort, safety, and practicality.